We needed to have a bike shop finally fix the flat in Mel's rear tire this morning, since I had apparently pinched the other one when installing it in Rawlins, WY...we woke up the next morning and the new tube was flat again. So that was the first order of business today. We found a bike shop in Jackson, WY, but got there before it opened, so we ate breakfast at a nice little place called Cafe Bohem. It took forever to get our food though, so much for getting out of town early today! 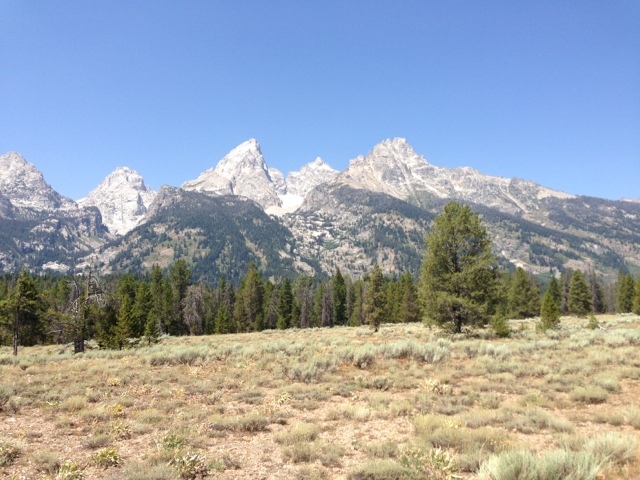 We went back and got Mel's tire fixed, picked up some groceries for the day at the store, and drove back to Grand Teton National Park. 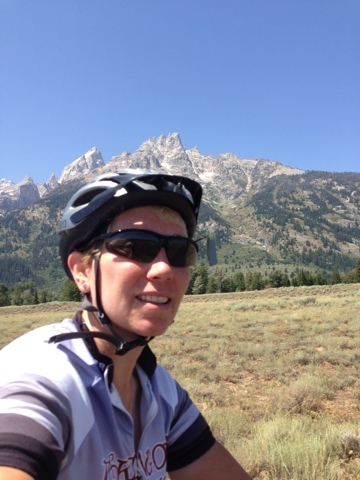 I couldn't resist biking at least some of Grand Teton National Park...especially since part if it had a wonderful bike path! 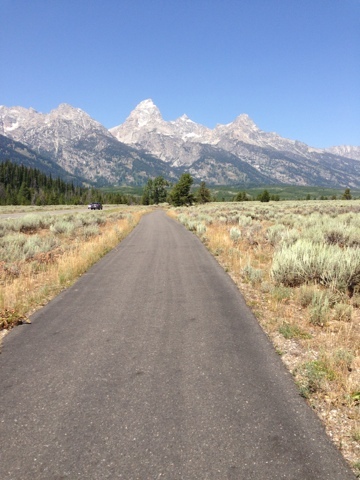 The weather was perfect today, and the bike path was nearly flat. 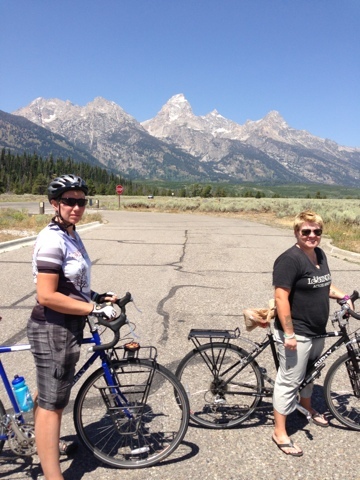 And with the mountains as a backdrop, it was a pretty perfect day! 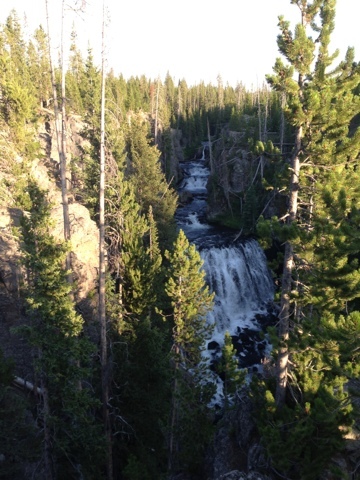 My mom and Mel came back to pick me up once they realized it was getting late and I hadn't eaten lunch yet, so I hopped in the car and snacked while driving to Yellowstone. 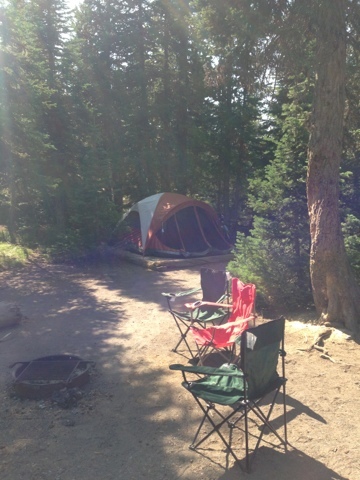 I had been trying to talk my mom and Mel into camping in Yellowstone, and they gave in and we picked on of the few remaining campsites (in a primitive area - pit toilets and no showers! 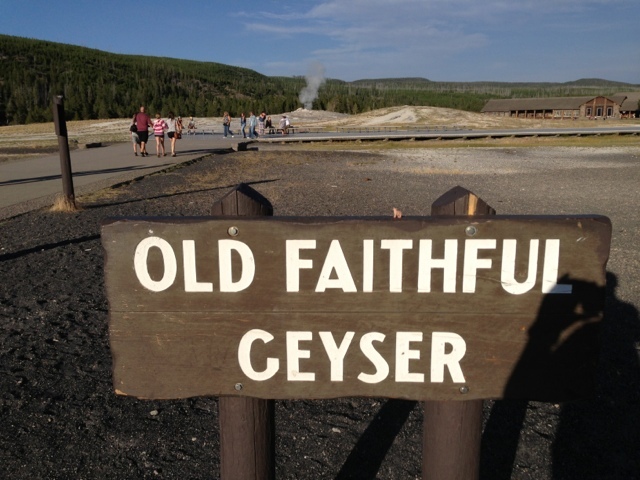 ), set up camp, and then set off to see Old Faithful. We got to one of the visitor centers, had a look around, then ran into Alex and Andy(www.lookmumnocar.blogspot.co.uk), who we hadn't seen since Utica, KY as we were leaving! They had a medical hold up in Colorado, but are back at it! It was great to see them for a bit again! Shep is on that sign, if you can spot him at the top there! 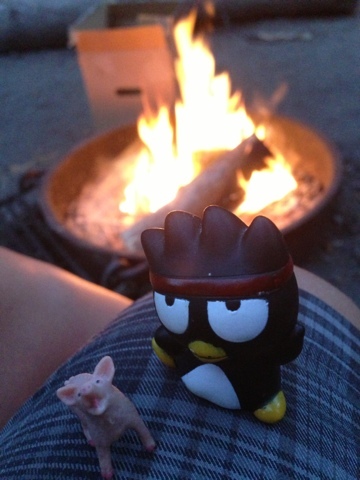 After that, we headed back to camp, made a fire, finished eating dinner, and just hung out and enjoyed the atmosphere. My mom and Mel used my moms two sleeping bags, and I used both of our fleece sleep sacks, figuring I would be warm enough. But...I was pretty cold all night. Even with a sweatshirt and sweatpants on. That was when I realized that if we were going to camp at any sort of higher elevations, we were going to need some warmer sleeping gear! Badtz and Shep enjoyed the fire too...from afar!